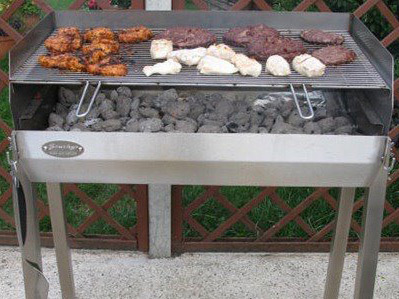 Stainless Steel Charcoal Grills UK Made And More! 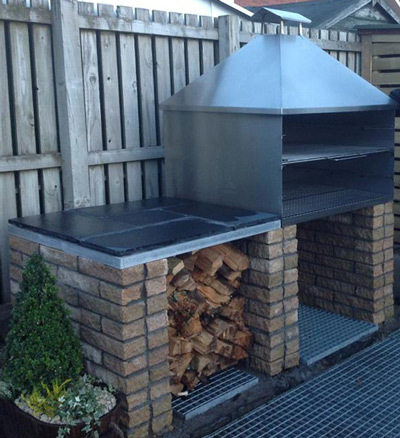 Stainless steel charcoal grills, UK made by hand, replacement grill grates, reverse flow smokers and much more. Nationwide delivery. Note:- These pages display our standard range, we can of course custom make anything you want, just call Paul on +44 (0) 7814 500755 or fill out the rapid response form below and we’ll be more than happy to discuss your requirements. Stainless steel is becoming more and more popular for indoor and outdoor kitchens alike and there are two basic types that we need to worry about. Type 304 – This is catering grade or austenitic grade, it is a higher quality (18% Chromium & 8% Nickel content) and therefore a higher cost. This is the grade you will find in professional kitchens. Type 430 – Commonly referred to as decorative or ferritic (only 16% Chromium & 0% Nickel content). You can tell type 430 easily in the showroom because a magnet will stick to it…and when in your garden it will gradually rust. In addition, type 430 stainless steel may become brittle after prolonged heating at 400-600°C…hardly a great feature for a charcoal grill. So how do you tell the difference if you’re buying on the internet and can’t put a magnet to it? From a construction point of view, type 430 is more difficult to weld. Look carefully at how a stainless steel grill is constructed, the type 430 giveaway is that it will be bent and screwed rather than welded. One other way the Chinese importers get their cheap price is by using non stainless steel fixings and fastenings, a sure fire way to initiate rust as soon as your grill is exposed to the elements. Look at the price, if it looks too good to be true, it probably is. A type 304 stainless steel charcoal grill is going to cost you a good few hundred pounds, if the grill you are looking at is cheaper then the construction materials used must be cheaper. Que Fresco charcoal grills are made without compromise and are designed not only to work well but also to give you a lifetime of grilling pleasure. All our stainless steel charcoal grills are made using 1.5mm thick welded type 304 stainless steel. We are also passionate about supporting British manufacturing and the local economy as a whole. Look critically at the thickness of the metal used, (this rule applies whether stainless or not). The thicker the metal, the better the heat retention performance and so the "cookability" of your grill, also the less likelihood that your grill will warp. If your budget doesn’t stretch to Type 304 yet you still want stainless steel, try and get something that is a minimum of 1.5mm thick, that way you stand half a chance of a decent cookout. The only negative (and it is a small one) to stainless steel is that in order for it to look at its absolute showroom best it does need regular cleaning and this isn’t difficult. Click here for our guide to cleaning stainless steel cooking grates. To clean other areas we recommend a wash down with warm soapy water, allow it to dry and then give it a massage with baby oil…yes, you read it right, baby oil really does work a treat. The “Cook N Serve” range of stainless steel charcoal grills is simple in design but effective when it comes to cooking. Clean lines make this grill look the part and solid charcoal pan ensures you have total control of your fire. 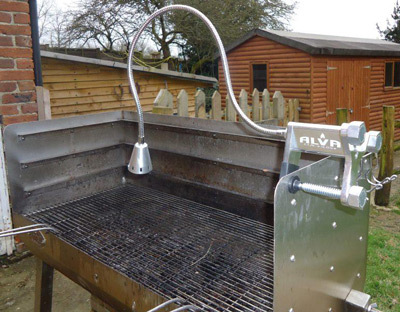 These grills are ideal for the pub beer garden - especially in World Cup year. Rust proof stainless steel fabrication means that these grills look good day in day out and are easy to clean. The grill housing is hand made using 1.5mm type 304g catering grade stainless steel with a single hole in the bottom for rain water drainage. Inside is a solid stainless steel tray for the charcoal, the only design to get controllable and efficient use of charcoal in an open grill of this type. 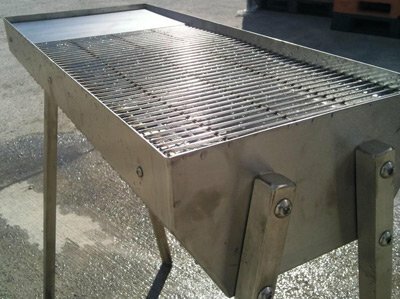 40mm square section stainless steel legs are bolted to the grill housing using stainless steel bolts and wing-nuts. The cooking grate is hand made using 3mm stainless steel bar and is seated on angle frame 30mm below the top of the grill housing for wind cover. These grills stand up fully to rigours of commercial use and are ideal for the frequent family barbecue alike. If you intend cooking for longer periods and parties then the adjustable height stainless steel charcoal grill was designed with you in mind. Having ability to vary the height of your cooking grate in relation to the charcoal has a number of benefits. Raise the grill height up and you minimise the chance of flare ups on fresh charcoal. Keep on the high setting if starting to cook fatty foods or those marinated in oil, lower the bar when the fat has been driven off. In addition, the adjustable height barbecue comes with a hooks on each side at the front of the grill housing for hanging utensils. A BBQ light is an extra cost additional modification over and above the standard prices. As you would expect, construction is in every other way the same as the Cook 'N' Serve range. My stainless steel charcoal grills are handmade in Britain…supporting British manufacturing. Want something different to the norm? Give me your vision, I'll prepare some drawings and when you're happy with the design I'll price it up. Call me (Paul) on +44 (0) 7814 500755 or fill out the rapid response form at the bottom of this page and you could have something like this in your garden this Summer. Following your order we hand make and deliver your grill within one week. Your grill is flat packed and requires only the minimum amount of assembly, in short, all you really have to do is use the included bolts and wing nuts to secure the legs and you’re ready to go. Your grill is designed and constructed to give you a lifetime of fun and BBQ cooking and you will need to take care of your cooking grates. Keep them hygienically clean and your BBQ food always taste better, use our guide how to clean stainless steel cooking grates...and don't forget the baby oil!